Unfortunately, most of the pilonidal cysts become infected. The sack at the end of the tract has a tendency to collect hair and other debris. Bacteria on the skin may also travel down into the cavity. This collection may lead to infection in the pilonidal cysts and it becomes a pilonidal abscess. The infection may lead to a number of unpleasant side effects, like inflammation, irritation, secretion of pus and blood etc. Although not dangerous, these symptoms are unpleasant to live with. Sometimes these symptoms include chills, nausea, and tiredness. 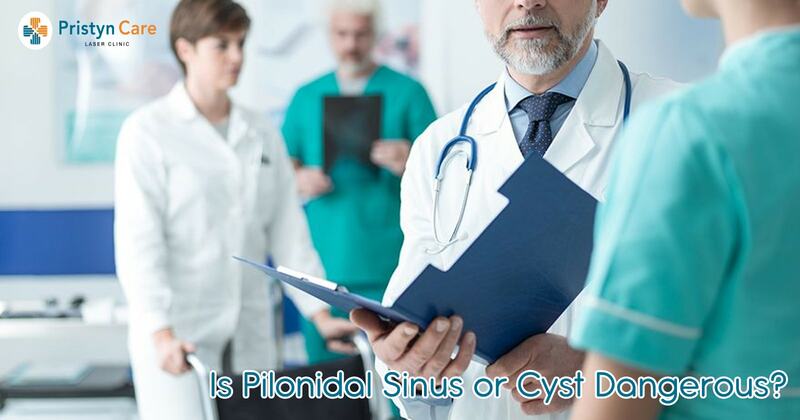 Most of the time, surgery is required for the long-term solution of pilonidal infections. Although surgery can be an effective way of treatment, there is always a possibility of complications associated with surgeries. The probable troubles include infection in surgical wound and risk of recurrence. In rare cases, pilonidal sinuses have developed a form of skin cancer inside the tract. This type of cancer is called squamous cell carcinoma. This disease is very rare, so most people having the pilonidal disease do not need to worry about this danger. The growth of cancerous cells seems to be associated with chronic pilonidal infections. Therefore, one shouldn’t delay the treatment and cure pilonidal cysts quickly to avoid any such conditions.